Have I told you how much I love colored pencils? Until I started buying good quality colored pencils, I didn’t realize their potential for making a really good drawing. Colored pencils come in different hardnesses just like drawing pencils. Harder pencils are more difficult to get a lot of color from and they don’t blend very well. I prefer to use a softer lead. I know most of us start off with colored pencils from Crayola or some other popular reasonably priced company and that is okay. Just remember when you are moving up in the school years that your children might be ready to handle and get better results from a better quality colored pencil. My favorite brand of colored pencils for older students is Prismacolor. I know these pencils are a little pricey but you can find smaller sets at art supply stores or places like Michael’s or Hobby Lobby. I always use a 50% off coupon when I am purchasing them at Michael’s. I also found them locally at the college bookstore and they had them at a *serious* discount. You just need to plan ahead and keep alert to sales. So how do I use colored pencils in my nature journal? I try to carry a set with me when I have room in my backpack. I remove them from the cardboard container and put them in a more sturdy plastic tub. I also have a tin filled with watercolor colored pencils from Prismacolor. If you are going to splurge on an art supply for yourself, these are worth the price. You use them just like regular colored pencils but then you can use a brush and water to make the drawing into a painting. 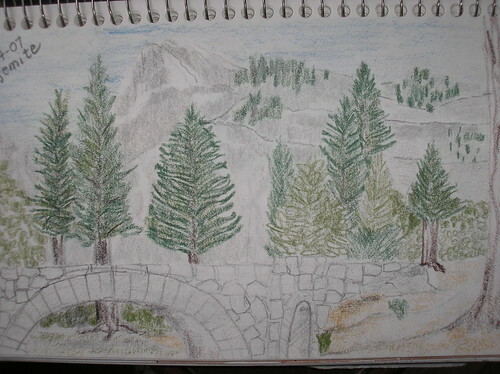 To begin a sketch in your nature journal using colored pencils, I suggest first sketching the scene or item out with your favorite drawing pencil and then you can go back and use your colored pencils. I sketched this out lightly with a drawing pencil first and then went back to add some color. 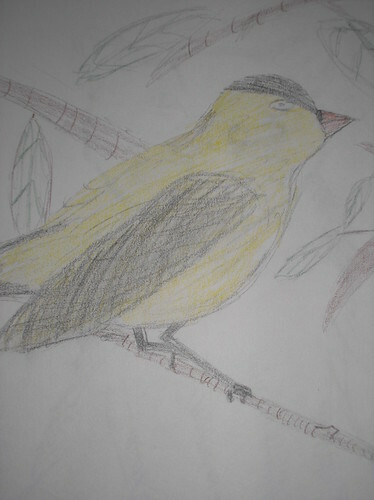 This sketch was done by my son after watching the goldfinches at our birdfeeder. He sketched the bird using a field guide and pencil. 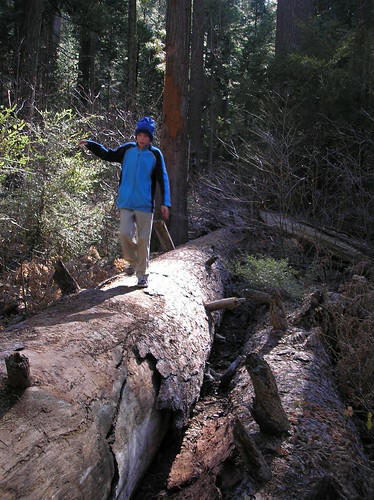 Then he went back and added the color to the sketch for his nature notebook. Now, how about a video tutorial? I made two videos, one that shows the differences between the colored pencils and one that shows how to use the watercolor colored pencils. Enjoy. There really is no mystery to using colored pencils. They don’t make a mess. They are easily transported. They give great results. Drawing with Children chapter 5 gives a list of art supplies to try and in this entry I am going to help you through choosing pencils to use in your nature journal. Pencils are easy to find and easy to use. They are small enough to fit in any backpack along with a nature journal. I always carry drawing pencils with me when we take our hikes and they are the “staple” of my nature drawing kit. I have two ways of carrying them. 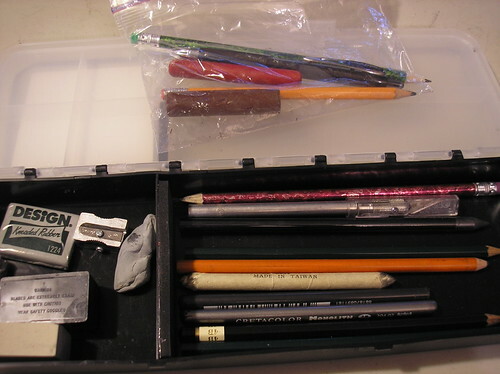 If I am carrying my big backpack and have room to fit it in, I carry my Art Bin filled with various kinds of drawing pencils, a good metal sharpener, a few erasers, and a drawing tortillion. If I am traveling light, I put a few pencils, my black ink pen, and a few old crayons in a Ziploc bag and carry them that way. Don’t laugh, it works. 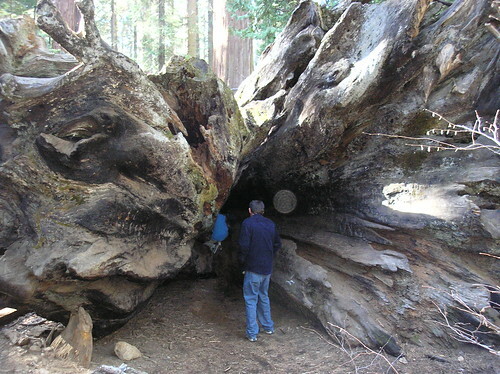 Here is a photo of what I am describing. I actually pulled these out of my backpack so they are just as if I were ready to take off for a hike. I must admit that I rarely just take along pencils. I almost always end up throwing in some colored pencils or watercolor pencils. I couldn’t find a single example from my nature journal where I only used a drawing pencil. I use them to sketch things out roughly on the page and then put on a little color. So what kind of pencils do you want to try? Most homeschoolers have a ready supply of the good old stand-by #2 pencils. This will do fine to start but for a variety of line you might want to try a different pencil that is harder or softer than the #2. She also recommends starting a sketch with the #H, adding in some shading and detail with the #2B, and then going back and putting on the darkest shadings with the #5B or #6B. Personally, I love to use the #4B and the #6B. When I am really into a sketch, I love to really make the darks dark and it is much easier to do with the #6B. If you really want to splurge, try a woodless pencil…it feels so good in your hand. Pencils are relatively inexpensive so you can pick up a variety and add them into your art box. If you are on a budget and want to work on your drawing skills, then try just using pencil and eraser and you can get beautiful results. I have added a few of my own drawings to this blog post to give you some encouragement in using a variety of pencils in your nature journal as well as in your daily sketching.